by Alan Caruba, Contributing Author: After decades of environmental claims that “global warming” would plunge the planet into catastrophic harm to its human and other inhabitants—at the same time blaming humans for causing it—the sheer arrogance and ignorance of these claims always ignores the real power that is represented by the Earth itself and the beginning of Spring should be proof enough for anyone paying any attention. This year, Spring begins in the northern hemisphere on Friday, March 20 at 6:45 PM EDT. In the southern hemisphere it marks the beginning of Autumn. Spring manifests itself in ways we take for granted yet it is a combination of many events that should make us marvel if we gave them any thought. For example, where does all the snow go? The U.S. and the rest of the world set records of snowfall levels throughout Winter. “Mountain snow fields act as natural reservoirs for many western United States water-supply systems, storing precipitation from the cool season, when most precipitation falls and forms snowpacks…As much as 75 percent of water supplies in the western states are derived from snowmelt.” Snowmelt ensures sufficient water for all of us and for the Earth that depends upon it for the growth of all vegetation. Nothing on Earth happens by accident. It is a remarkable inter-related system to which we give little thought. The sheer power of all those blooming flowers and trees should tell us something about the power of Nature that dwarfs all the claims that humans have any influence whatever on the events of Spring or any other time of the year. Then think about the role of the animals with whom we share the planet. In the Spring many come out of hibernation in their dens, while others such as birds make lengthy migrations from the warmer climes to those in the north. The huge migration of Monarch Butterflies should leave us speechless. Spring is a time when many animals give birth to their young. A sign of the Spring that leaves us breathless is the way it is the season for the aurora borealis. Dr. Tony Phillips of NASA notes that “For reasons not fully understood by scientists, the weeks around the vernal equinox are prone to Northern Lights. >From Canada to Scandinavia they provide a great show. “Such outbursts are called auroral substorms and they have long puzzled physicists,” says UCLA space physicist Vassilis Angelopoulos. They represent “a potent geomagnetic storm.” The equinox in Spring and Autumn is a time when magnetic connections between the Sun and Earth are most favorable. One book, “Silent Spring”, by Rachel Carson, first published in September 1962, started the environmental campaign against pesticide use for any reason, leading most famously to the ban on DDT in the U.S. What Carson neglected to tell readers was how they were supposed to cope with the trillions of insects that come with the advent of warm weather. No pesticide use does not mean less mosquitoes, less termites, less flies, less ants, or less of any other insect species and the diseases they spread, property damage, and the damage they cause to crops of all descriptions. And, of course, the much of the pollination of crops and other vegetation depends on insect species. 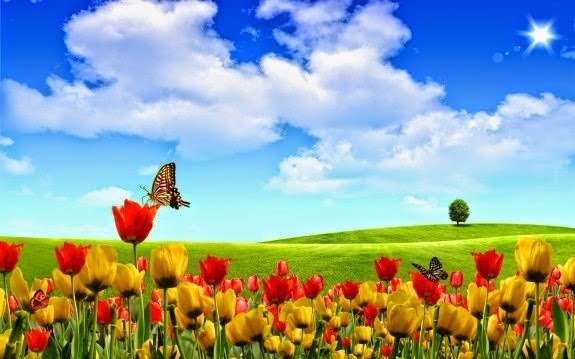 Spring is a time of renewal in the northern hemisphere and it occurs with enormous levels of natural power. Most people, however, are oblivious to that power as they enjoy the sight of flowers and trees blooming. I could almost guarantee that you will read or hear about “global warming” or “climate change” being attributed to the arrival of Spring. Do yourself a favor. Keep in mind that those claims, like Rachel Carson’s, represent an anti-humanity, anti-energy, and anti-capitalism agenda of the environmental movement. Instead, celebrate the seasonal renewal of life on Earth and give thanks for the energy that permits you to control the environment of the structures where you live and work, that provides you the means to get in your car and go anywhere, and that powers every device you use.